The first of the 8 factors influencing the identity and quality of the tea in your cup is its origin. It is a direct and highly defining feature of your tea. For some places of origin, this goes as far as downright telling you the very type of your tea, without any further information, visual inspection or tasting. And knowing the type, of course, will provide you with hints on many other properties of that tea. Here is an example: Hangzhou, in the eastern Chinese province of Zhejiang … Well, got it? Exactly, Long Jing Green tea, of course, because this is the tea mainly grown in Hangzhou. It could also be said that the cultivation and processing of Long Jing tea are a defining feature of Hangzhou’s “tea culture”. And only for that of Hangzhou… Because the adaptability of the tea plant described in lesson 1 not only ensures that the tea plant adapts to different places. It is also responsible for the fact that the tea of one particular cultivar is virtually irreproducible in another place. Of course, it’s not always as easy as with the chosen example of Hangzhou and Long Jing. For one thing, there are places where more than one tea plant variety is at home. On the other hand, there are varieties that can be processed in different ways. For example, both as green and as black tea. Still, the farther you can geographically limit the origin of your tea, the more it can tell you about it. A prerequisite for this, of course, is that you have some basic knowledge of the individual tea cultures. 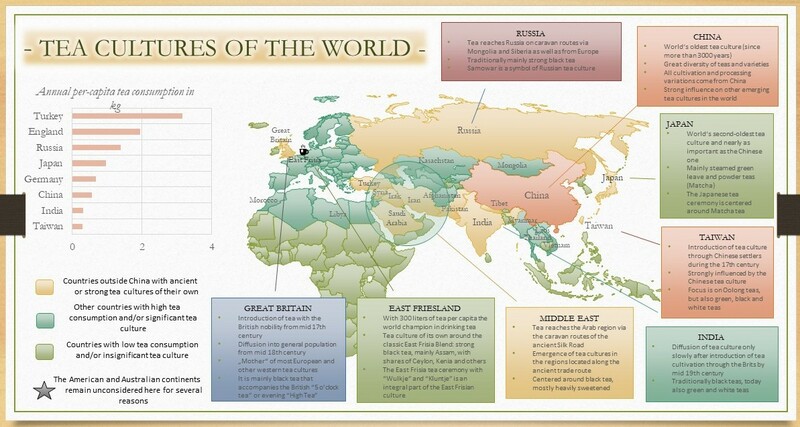 As a rule of thumb, every place of origin relates to a specific tea culture. You surely know the great tea cultures of the world, China, Taiwan, Japan and India. In addition, there are many smaller national tea cultures, such as Vietnam, Korea, Indonesia, Turkey, etc. 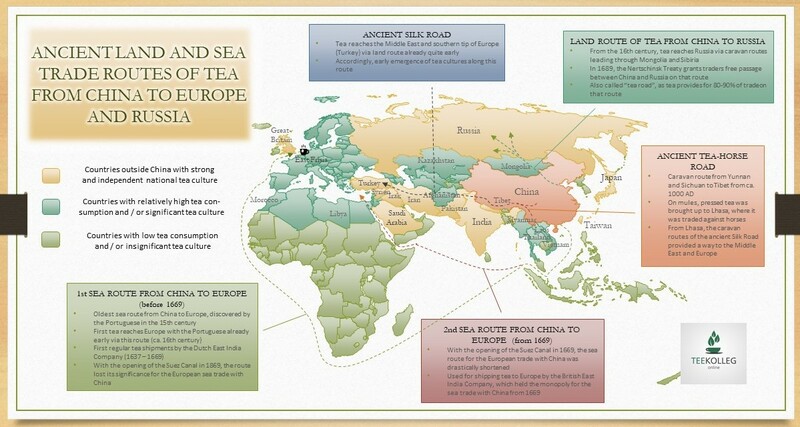 All of these tea cultures have evolved over hundreds, or, as in the case of China, thousands of years. Accordingly, each tea culture has its own characteristics, which in addition to the specific terroir and local cultivars also include individual standards for cultivation, picking and processing, right down to the preparation of the local teas. Besides such hints on objective properties of your tea, the tea culture associated with its origin also provides you with what I’d call your tea’s “cultural and historical background”. After all, a tea culture does not come about in a social and historical vacuum. Rather, it is embedded in the greater culture of a country, spanning religion and socio-cultural fabric. Thus, the habits around drinking tea in a specific place are always a mirror of the prevailing customs there. In addition, the study of the tea culture of a country offers you a colorful and entertaining journey through its history. Here, the top layer is the – national – Chinese tea culture as a whole, 5000 years old … As virtually everything about tea was invented in China, there is every cultivation method, every form of picking, and every processing category. There are – at least – hundreds of varieties, tea trees, tea bushes, all sizes … Small leaves, big leaves, whole leaves, CTC, powdered tea… I think you got my point. In Wuyishan, there are various Wuyi “Rock Oolong” tea cultivars such as Da Hong Pao, Tie Luo Han, Rou Gui or Shui Xian. Also, the region is famous for its Lapsang black teas. Both are part of Wuyishan’s – regional – tea culture. Still, if you know that your tea comes from Tong Mu village, it’s probably no rock oolong tea, but black Lapsang tea. Because Tong Mu is the place of origin of the famous Lapsang Souchong tea. And insiders to Wuyishan will certainly consider Tong Mu area as a – local – tea culture of its own. A special case are countries of origin that have little or no tea culture. However, the lack of tea culture in connection with a certain origin still tells you a lot about your tea. An example for this would be Kenya. Although Kenya is one of the largest tea producers in the world, hardly anyone drinks tea in Kenya. Rather, the country produces tea mainly for export, reducing tea from Kenya to a kind of “commodity”. Accordingly, the industry is about producing as much tea as possible at the lowest possible price. As a result, you will rarely find pure tea from Kenya in your cup. Because the major part of the tea produced there either goes into “blends” (mixtures of different types and origins) or otherwise into products for which the quality of the ingredient tea plays a subordinate role. Another special case are tea cultures, which are not also origins. Examples for this include Great Britain and East Frisia. Still, we refer to these countries as tea cultures, because of specific cultures have developed there around drinking tea. For example, none of the teas in an English Breakfast Tea is grown in England. Rather, it is the recipe and the associated custom that have emerged from the British tea culture. At a closer look, it becomes clear that such “tea drinking cultures” have developed primarily at the endpoints of the historical land and sea routes of tea from Asia to Russia and Europe. We’ve already established that the origin can only provide you with information about your tea, if you are knowledgable about the related tea culture. And the more you know about this, the richer your hints. And the more specific the indication of origin, the more precise the information you receive. Well, I’ve got a sealed, opaque bag of tea here for you… Nothing is written on it, except of “Tea, Japan”. Now, based on this information only, what can you already tell – with high probability – about the tea in that bag? Look at each of the other 7 factors influencing the identity and quality of the tea in your cup. At this, think about what the origin “Japan” alone tells you about each of them. Finally, think about ways how to verify your findings. For the latter purpose, of course, you may also open that bag now… and read the seller’s product description! At a later point, My Little Tea School – The ABC of Tea will take on covering the world’s major tea cultures in detail. For the time being, however, ntext week’s lesson will proceed with the second identity and quality factor of the tea in your cup: terroir!